There are many ways to improve your air quality at home, having good air quality is essential for your family’s health. There are many ways to begin improving indoor air quality from taking small steps around your home to also taking larger measures to improving indoor air quality long term. It is so important to improve indoor air quality, as indoor air can be 2 to 5 times more polluted than the outdoor air. Having poor indoor air quality in your home can have adverse effects on health problems such as asthma and other respiratory problems. Poor indoor air quality can not only have effects on our health, but also on the building itself due to problems such as condensation, mould having negative effects on the structure and material of the building. Although it is important to take small steps to improve indoor air, here at BPC we recommend bigger and more permanent solutions. The best way to really begin improving the indoor air quality in your home or work place is to install a ventilation system. Positive Input Ventilation System-a wall or loft mounted unit that pushes filtered, fresh air through a property. A PIV system is a perfect solution to combat condensation in the home. By eliminating condensation, a PIV system creates a healthier living environment by supplying fresh filtered air at continuous rate throughout a property. Check out our Vent Axia Positive Input Ventilation Units. Mechanical Extraction Ventilation - designed to extract moist and stale air from up to several rooms at any one time, these rooms include kitchens and bathrooms. Mechanical Extraction ventilation (MEV) units are beneficial over fans as they are near silent and are more energy efficient See our range of MEV Units. Mechanical Ventilation Heat Recovery - works by supplying and extracting airflows in and out of homes and commercial building. Heat recovery units can recover up to 90% of normally lost heat depending on the unit and the application. A Mechanical Ventilation Heat Recovery System (MVHR) system works to eliminate condensation and mould within a building with constant ventilation. By eliminating condensation, it also reduces the build-up of mould and damp. 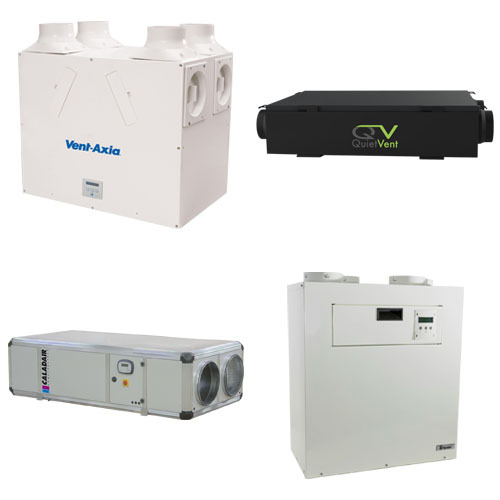 See our range of MVHR Units. Why Do We Need Ventilation? Unfortunately, due to the great British weather we spend considerable amounts of time indoors. Therefore, good air quality is essential to you and your family’s health. When we talk about poor air quality in the home what we mean is smoke, bacteria, mould and carbon monoxide and this is all due to the lack of ventilation in homes. If you want to ventilate your home most of us open windows and doors which lets the heat escape not to mention causing risk to your home security. Our most recommended ventilation system is Mechanical Ventilation with Heat Recovery. A heat recovery system basically brings the outdoor air inside and recovers the heat. This ensures your home receives, fresh, filtered air without pollen, dust or insects. As homes have become more insulated and airtight over the years this has led to a build-up of toxic gases within our homes. Problems such as condensation and mould can become significant and cause health concerns such as asthma. Dealing with damp and mould can be costly but by acting early and installing a ventilation system will prevent the build-up of humidity and vastly improve the indoor air quality. Not only will this in turn improve the health of your family, but it will have a positive impact on the fabric of the building. Let us help improve your indoor air quality! At BPC Ventilation we offer design, supply and if required we can installation your home ventilation system, both in the UK and around the world. Whatever your requirement, budget or setting, BPC can provide the solution for you. The systems BPC offer will help to make your property as eco-friendly as possible using demand energy recovery ventilation and (HRV) (MVHR) which adhere to the Code for Sustainable Homes. We can design, supply and install your ventilation system! BPC can design, supply and install ventilation systems such as heat recovery systems that will supply fresh air to your home and extract stale and moist air. Other systems include mechanical extract systems and positive input ventilation systems. Check out our knowledge centre for more information on our range of ventilation systems. If you would like any more information on our systems and how they improve indoor air quality, contact us or check out our knowledge centre. BPC Ventilation specialise in heat recovery for any premises including all sized homes and both small or large commercial premises. We can design, supply and if required install your system for you! For more information on how heat recovery systems work and for more information on our products and services, call our sales and technical teams on 028 2827 5150 and we will be happy to help! Alternativity you can visit our website for our range of products.